1. You balanced writing a novel/earning an MFA with a full-time job. How? And why? What drove you? When I first decided to apply for MFA programs—when I committed to the idea of myself as a writer—I hadn’t worked in almost two years. I’d left my job to take care of my mom through a couple of surgeries, and that journey home forced me to face some childhood trauma from her initial battle with cancer. The whole thing left me in a state of depression that eventually became a spur to examine what I wanted in life. I realized that what made me feel happiest and most fulfilled is when I am creating art, and words are my go-to medium. I started applying to graduate programs and jobs at the same time. I’m one of those people who’s doing everything all at once or nothing at all, and I think I’d built up a lot of energy during that down time so working while going to school felt like a good way to throw myself back into living. Plus, the more I wrote, the more the act of writing energized me. You know how intense the MFA program can be, and by the time I reached the third semester requirement of teaching a class while doing all the regular coursework and trying to complete a draft of my thesis (all while working), I started fitting writing into time I didn’t even know I had. I could be found at lunch in the break room typing out a few pages or I’d be scribbling on the bus. I was so engaged in the book and wanted so badly to complete the program on time that the work just happened. At the end of that semester I remembered a lot about teaching and a lot about work, and even though I barely remembered having written, I had a full draft of my manuscript. That act of fitting writing in wherever possible has served me well in the years since grad school. During the best weeks I write or edit for an hour before work, another after, and then three to four hours each on Saturday and Sunday. I want to say that you make time for what’s important, but I have sacrificed a lot of time with friends and loved ones to work on my writing. What keeps calling me back is that the writing is the one thing in my life which cannot exist without me. Sometimes I do step away or take a break, but I come back because that act of creation is so essential to my sense of fulfillment. 2. What was it about THIS story (Polska, 1994) that compelled you tell it? It seems highly relevant now, what with Russia’s aggression in the Ukraine. As a high school exchange student in Poland in 1994-5, I fell in love with the country and the people. I also became deeply fascinated with the culture and the way the country was and was not changing in the wake of the Soviet Union’s demise. Writing Polska, 1994 was an excuse to explore all kinds of questions about the country and the people. I also had a fascination with oppression that came from spending a year in Chile as a young child under Pinochet’s rule. 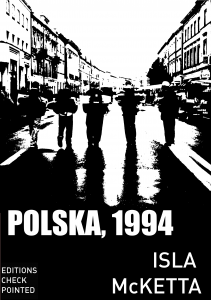 Writing Polska, 1994 was also a chance to explore the personal aftermath of an authoritarian regime. I’m watching carefully what happens in the Ukraine now both because of my deep affection for Poland but also because my grandfather’s family came from the Ukraine, specifically Galicia which has at times been Polish, Austro-Hungarian, and Ukrainian. Although my family emigrated before World War I, writing this book became a way to think about what my family’s life would have been like if they had stayed in Eastern Europe. 3. Your novel is elegantly crafted. Every word feels lovingly chosen. Talk about your process, about first draft vs second (or 3rd, 4th, 5th). What phase(s) do you most love? That’s awfully nice of you to say. Thank you. The first drafts of Polska, 1994 were very much about getting words on the page and exploring where the story was going. I did spend some time perfecting sentences, but I’d be surprised if any of the early ones survived. I learned through writing this book how messy I had to get with the writing—sometimes just blarping information onto the page—before I could engage my perfectionist self. Once I changed the point of view back and forth a few times and had the basic shape of the story, then it was time to really start editing. I printed out the manuscript and cut it into paragraph-sized chunks so I could physically pair like with like and eliminate the unnecessary. The book was around 20,000 words shorter when I was done with that exercise. The next step was to read the entire book out loud to get a sense of the rhythm and clean up the sentences. Of course revising a novella is much easier than if I was working on something the size of War and Peace, but it was necessary for what I wanted the book to be and I’d like to think I would have done it even if the book was three times as long. I edited and rewrote this book until I was certain I had taken it as far as I could—I think it was seventeen full drafts in all—and then my editor helped me get through another three drafts before the book was done. I have two favorite parts of the writing process. The first is in that cutting up part. I love physically breaking the tyranny of the page and finding the form that best communicates the story. It’s funny because I always think that I write much more abstract prose than I do, and this reordering and clarifying part is probably exactly the stage that tips my work toward concrete communication. I’m learning now, as I’m teaching myself to write poetry, that the comprehensibility of Polska, 1994 is a choice I made, and it’s the right choice for that book. My second favorite stage is any day you come back to the work after not reading it for a while (sometimes you have to let your work breathe before you can edit it well). I will do anything to avoid reopening the work, because in that cooling off period I’ve developed an idea of how terrible it all is. But then I open the manuscript and find phrases that are so good and so unfamiliar I don’t feel like I wrote them. That moment is perhaps the most rewarding part of the whole process. 4. Meanwhile… you wrote and published a book of writing prompts. Tell us how/why that came about. After all that writing and rewriting, I was ready to try something lighter. My day job involves writing blogs and other copy for the internet in this easygoing voice that tells you how simple it is to change your life for the better. My coworker, Rebecca Bridge, noticed that Write Bloody Publishing had a contest for a book of writing prompts. 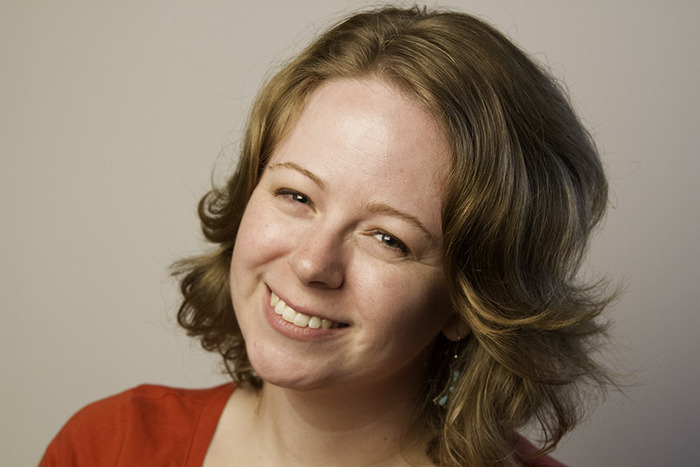 She has an MFA in poetry from the Iowa Writers’ Workshop and taught creative writing for years, and we thought it would be fun to take all the advice we’d received over the years and all the lessons we learned through our projects and write a book that could help and inspire other writers. We wrote the book comparatively quickly and bouncing the text back and forth was fun. 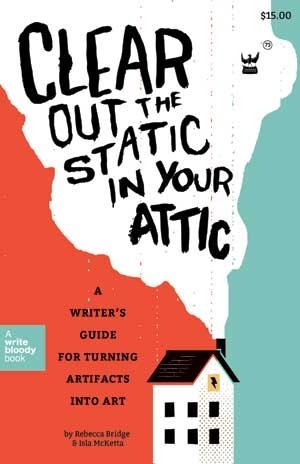 The result is Clear Out the Static in Your Attic: A Writer’s Guide for Turning Artifacts into Art. Writing is really hard work, but it can be immensely enjoyable at the same time. This book, I hope, can help writers of all skill levels balance the two. It might just change your life. I loved hearing about the journey of bringing Polska, 1994 to the readers. And I’m so very excited to read it. I’m so proud of both of you.